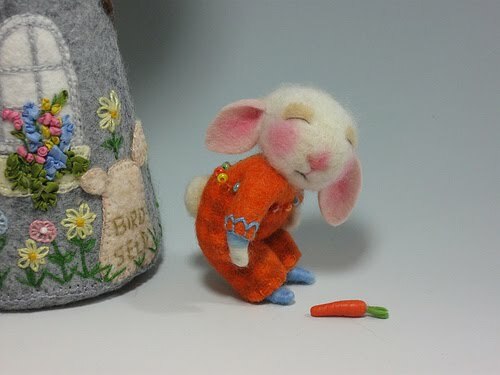 Raspberry a needle felted thimble bunny 1-3/8"
It is amazing to me the talents of others. 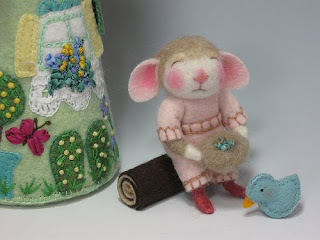 This darling little thimble is needle felted. This artist has done some precious things. I love this little thimble. The detail she has achieved in less than an inch and a half is remarkable. Isn't he darling as well? The faces on her creations are adorable. And this little bunny is feeding her friend. Martha-The artist is indeed talented. I can't imagine working on something so minute. The expressions are priceless! Those are precious - just amazing how someone can create something so lifelike out of - felt! And I thought I didn't care for felting. I wish I could have 1 or 5 of them. Those are so sweet. Makes me want to touch one of them. 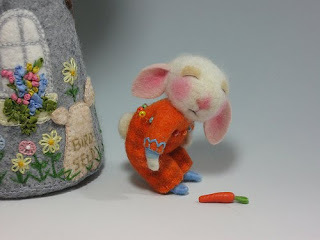 Martha, thank you for posting my needle felted critters on your blog! I am so glad you like them and how kind the other comments here were also. Wow! I hadn't heard of needle felted cratures until my blogger friend Kim made one that I won in a giveaway! I am so impressed. These are great.